Apparently I'm a Romance Reader? I'm generally not a big romance person. I'll take it as a subplot, but even then I'm super picky about which romances I like. 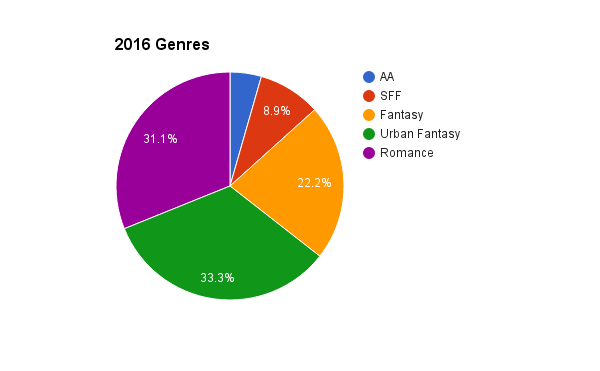 So it's super weird to look at my 2016 reading stats and realize I've read a lot of romance novels this year. Like...weird. I can probably attribute the shift to reading a lot of free e-books that I can breeze through in a night or two. They're good for an escape from law school homework--no pressure, no high expectations, etc. Has anyone else experienced a shift in genre reading preferences this year? I am not a huge romance person either. I mean, I LOVE romance but only when it is part of a bigger plot, like you. I am sorry that a lot of them were 1-stars, too. I feel like over the past year or two, I have been reading much more fantasy/sci-fi. And less contemporary I think. This is so fun to think about, thanks for sharing it!